There’s no simple explanation of why some states have statewide public radio networks while others don’t. But a look at where networks have taken root does suggest a few key factors. We determined that 18 states do have statewide public radio networks: Colorado, Georgia, Hawaii, Iowa, Maine, Minnesota, Mississippi, Nebraska, New Hampshire, North Dakota, Oregon, Rhode Island, South Carolina, South Dakota, Vermont, West Virginia, Wisconsin and Wyoming. And yes, Virginia isn’t on the list. 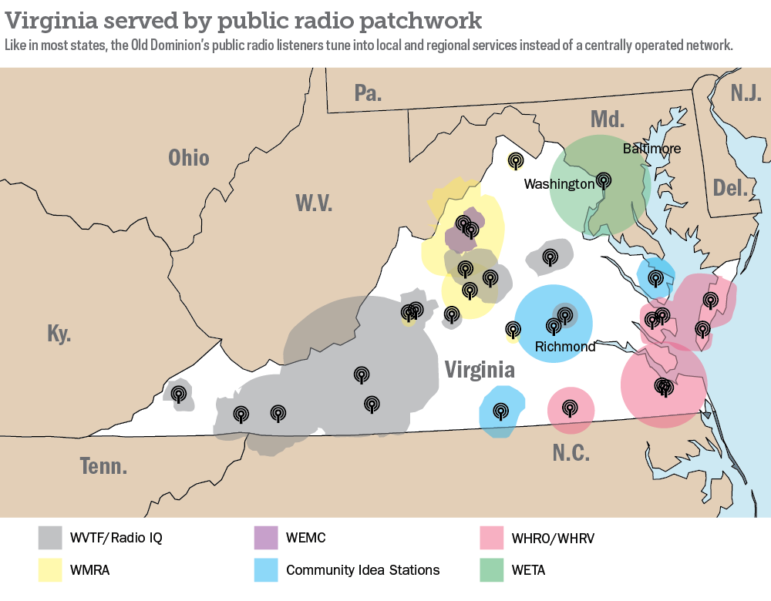 Even without a network, Virginia’s residents are well-served by public radio. The five licensees with the most coverage each operate multiple stations. Some smaller translators not shown. Coverage areas are 60 dBu contours. Map: Chris Campbell/Current. Source: Public Media Co.
WVTF/RadioIQ, based in Roanoke, has grown into Virginia’s network with the widest reach and largest audience. Stations broadcasting the Radio IQ news service stretch from the state’s southwestern tip to Fredericksburg in the northeast, covering a population of more than 2 million Virginians, according to the consultancy Public Media Co. The broadcaster’s music stations reach a potential audience of 765,000. Other Virginia stations covering populations of more than 1 million include Commonwealth Public Broadcasting’s Community Idea Stations, based in Richmond, and WHRO and WHRV in eastern Virginia’s Hampton Roads. Harrisonburg’s WMRA and WEMC, licensed to James Madison University, reach smaller audiences. And listeners in the Washington, D.C., suburbs can tune to the city’s stations as well as WETA-FM, based in Arlington, Va.
Several of these stations signed on around the same time and relatively late in the development of radio as a medium. That appears to be one factor that stifled the formation of a statewide network. WMRA began broadcasting in 1969. WVWR, later WVTF, signed on in 1973 — the same year as WTGM, which became WHRV. Meanwhile, in Wisconsin, South Dakota and Oregon — all states that now have statewide networks — the first station in each network signed on before 1935. In Virginia, “the notion of a statewide network was never in any single entity’s mind when they were creating their presences,” said Matt Bingay, executive director of WMRA. Bingay has worked at the station since 1992, save for a yearlong stint at New Hampshire Public Radio. Instead, Bingay said, “we were like little seeds being planted” in different communities — “We all grew up independently and small.” Western Virginia’s mountainous landscape also hindered connections between stations as they developed, he said. Another contributing factor may be Virginia’s lack of a public TV network. In several states, statewide television networks “provided the venue for being able to build up the radio networks,” said Skip Hinton, former president of the National Educational Telecommunications Association. Adding a radio network to a TV network was an “easier task than to build out radio in individual communities because you could do it in a centralized fashion,” Hinton said. In South Dakota, TV network towers were built to accommodate a future statewide radio network, according to South Dakota Public Broadcasting. A state’s support for public broadcasting also appears to be related to whether the state has a public radio network. In 13 of the 18 states with networks, the state gives direct funding to public broadcasting. And in at least seven of those states, state funding has made up more than a third of the network’s budget in recent fiscal years. Both South Dakota Public Broadcasting and Mississippi Public Broadcasting receive more than half of their funding from their states. Virginia ended direct funding for public radio stations in 2011. The following year, it eliminated funds for all public media. Network a bad fit for Virginia? In states that do have statewide public radio networks, executives at those broadcasters say the centralized structure allows for service that wouldn’t be possible otherwise. Meanwhile, Virginia’s separately operated stations have gotten by as standalone outlets. For example, providing public radio coverage for South Dakota’s sparse population would be difficult without a network, said Larry Rohrer, director of content at South Dakota Public Broadcasting. Mississippi, which has the highest poverty rate in the U.S., needs a statewide network to provide programming for poor rural communities that couldn’t sustain local stations, said Jason Klein, radio director at Mississippi Public Broadcasting. Kelley Libby told us that she wondered whether Virginia’s lack of a network was hampering public radio’s ability to connect listeners across the Commonwealth. Station leaders, however, see upsides to the lack of central control. A statewide network would be a “huge mistake” for Virginia, WHRO’s Schmidt said, because stations would lose the ability to program to their audiences. That would be a drawback in a state where issues vary depending on the region. Residents in WHRO’s area have witnessed rising sea levels, and the station is focusing on environmental topics. But audiences farther west may have other priorities. As for the arguments that a network could harm stations’ local news coverage, Libby asks, “Can you target audiences in your area but still have a statewide network?” Though stations in Virginia do share content, Libby said it consists mainly of pieces from several reporters within a division of WVTF. As an example of the kind of content-sharing she envisions, Libby points to the Virginia Mercury, a nonprofit news website that launched this year to cover state government and policy. In addition to its own reporting, the site rounds up news from publications across the state. “Certain things are relevant to me, even if I don’t live in that part of the state,” she said. “I just wonder if it would be beneficial for us to have a medium that puts people in conversation with each other,” Libby said. Submit your own question to Currently Curious in the form below. It could be investigated in a future story. A reader asks: Why do some states lack statewide public radio networks? A Virginia producer wonders if states without public media networks are missing an opportunity to connect audience members. “Some smaller translators not shown.” Correct. For instance, the map fails to show that WVTF / RADIO IQ serves Richmond with all news and information and was the first such station to do so. Hi Mike — you are correct, and that’s actually one translator I wanted to be sure we included. We’ve updated the map. Thanks for pointing that out. Also minor typo: “in the 18 states with networks” that should be 13, since there are five that don’t get state funding (like Rhode Island). The map is limited to stations actually located in Virginia, so no WAMU, though of course they do have substantial coverage in Northern Virginia. And yes, typo fixed — thanks for the catch. I understand you gotta draw the line somewhere, but that’s vaguely crazy, Mike. The towers are less than five miles apart on opposite sides of the Potomac River. To include WETA but not WAMU simply because the tower just happens a couple miles over an imaginary line?? It’s not like because WETA’s studios and tower happen to be Virginia that they have some special affinity for serving a Virginia audience, compared to WAMU. They both are FCC-licensed to DC, but more importantly than the farce of “community of license” is that both realistically broadcast to a DC audience. Neither Maryland nor Virginia: DC. As i, the DC metropolitan area. I mean, until recently, both of Rhode Island Public Radio’s primary signals…WNPN and WELH…were located in Massachusetts. WELH broadcasts from the Wheeler School Farm in Seekonk, and WNPN broadcast from North Dartmouth (last month we formally moved it to a tower in Tiverton, RI). On the extreme, there’s “WNPR” which is “Connecticut Public Broadcasting Network” and they are, technically, a statewide network covering a lot of Connecticut. Although oddly, they don’t cover it all (much like Rhode Island), one of their signals covers parts of CT yet the tower is in another state (I’m referring to WRLI in Southampton, NY/Long Island…and also much like Rhode Island with WELH in Seekonk, MA) and there’s a competing outlet in the state in the form of WSHU and it’s many repeater stations, mostly on Long Island and the southwestern corner of the state (yet again, much like Rhode Island with WGBH reaching well into RI’s borders). I think it highlights that there is no really solid answer for why state do or don’t have statewide public radio networks. And that defining a “statewide public radio network” is a difficult and slippery task to begin with. But I think you’ve hit on probably the biggest over-arching reasons: either it’s too expensive to serve certain parts of certain states UNLESS there’s a statewide network, or the differing parts of a given state have populations in different regions that’re *so* provincial that trying to serve all of them with singularly-branded content stream is counterproductive (Massachusetts and upstate New York come screamingly to mind). Wait…what exactly do you mean by “Virginia-based”? Where the tower is located? Where the studios are located? Or where the Community of License is located? Huh, at this level of the thread, Aaron, I can only reply to myself! Not only are we nitpicking, we’re navel-gazing. By Virginia-based I mean where the licensee is located. It’s not an entirely idle question because if you’re basing it on where the studios are, it can lead to some weird results. Not necessarily in WAMU/WETA’s case, but overall, certainly. The whole situation in New Jersey comes immediately to mind. As messed up as it is, I would almost argue that using Community of License is probably a better tool for this purpose, because for most…not all, but most…pubradio outlets the COL actually reflects the community that is most connected to a particular transmitter/tower. Like WAMC on Mount Greylock in Massachusetts, but it’s licensed to, and has studios in, Albany NY. If Virginia did have a statewide radio network, maybe it could be set up in a way that local stations could replace select portions of the statewide programming with their own, similar to the way portions of broadcast tv’s national feeds are replaced by local affiliates programming such as news , weather & sports. Then Virginia public radio listeners could enjoy the best of both worlds. Not to mention the possible revenue deals a statewide audience could bring. The associated graphic is substantially out-of-date. WHRO/WHRV operates six ADDITIONAL full-power stations in eastern Virginia such as 46000-watt WHRX in Nassawadox, 9600-watt WHRG in Gloucester Point, 6000 watt WHRL in Emporia and others. These stations broadcast both full-time NPR and full-time classical and fine arts programming. WHRO also operates translators which reach up to 600,000 people in Hampton Roads. Public Radio coverage of the state of Virginia looks substantially different when this map is fully up-to-date. Hi John — you’re correct, we overlooked those stations and have added them to the map. Thanks. Thanks Mark. Much appreciated. Interesting article BTW. How about WVLS 89.7 in Monterey, Va. and WCHG, 107.1 in Hot Springs, Va.? Both stations are repeaters of WVMR, Frost WV, an NPR “non-member” station that carry NPR hourly news plus programs from Content Depot, segments from Va. Public Radio and commercial news network VNN (minus the commercials). These stations also carry significant amounts of their own programming from their own studios. We too received funding from the Commonwealth of Va. until it was cut in 2011. Hi Chuck, thanks for pointing these out. We did want to keep the map (and article) focused on public radio stations actually based in Virginia, however. Well, I understand you have to draw the line somewhere. Just don’t forget about us! Hi Trip, thanks for your comment. Because WMLU is a small student station not connected to the stations and networks our article focused on, I don’t think it is one that needs to be included on this map. But WMRY and WMRL should have been included, and we’ve added them. The tower in Winchester is WMRA’s translator there. And yes, we are using the 60 dBu contours, and I’ve revised the caption to clarify that. Student station WMLU simulcasts WMRA more than half of the day and is not included. Student station WEHC, by contrast, simulcasts WVTF more than half of the day and is included. I’m not understanding the difference between the two.